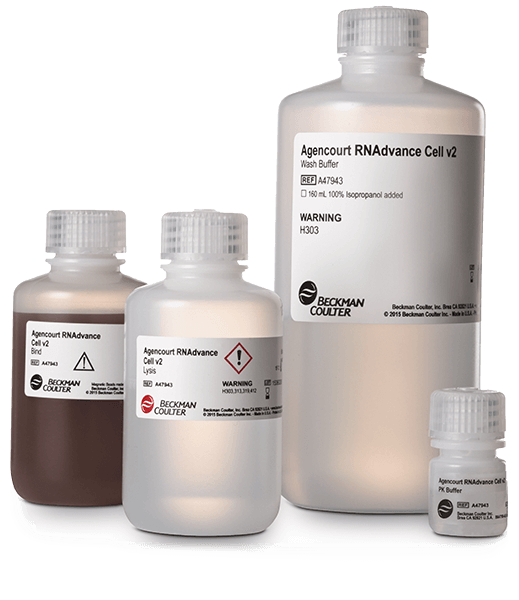 Based on patented Solid Phase Reversible Immobilization (SPRI) paramagnetic bead technology, the RNAdvance Cell v2 Kit is known for consistently delivering pure nucleic acids of high quality and yield. This system reliably delivers high RNA recovery and purity without the need for filtration or centrifugation. The Kit chemistry is an automation-friendly process for isolating total RNA for utilization in microarray and real time qPCR* applications. *The PCR process is covered by patents owned by Roche Molecular Systems, Inc., and F. Hoffman-La Roche, Ltd.